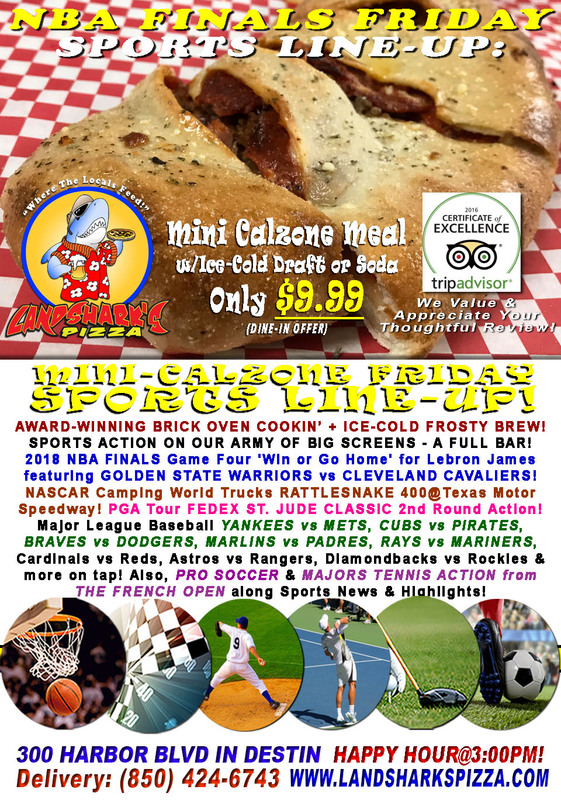 / BBQ / Landshark’s NHL Stanley Cup Golden Knights vs Capitals, FRENCH OPEN, PGA & More $9.99 Awesome BBQ & Brew Special! Hockey’s BIGGEST event continues today at Landshark’s in Destin alongside Majors Tennis & Baseball, Golf & Destin’s Best Traditional BBQ! Savor today’s tastebud-friendly special on Destin’s MULTI-YEAR 1st Place Blues, Brews & BBQ Festival Winner, Slowly smoked, tender, juicy & delicious FALL-OFF-THE-BONE PULLED PORK basket with Succulent Seasoned Fries and your choice of an icy-cold domestic Draft Beer (or Soda) – Just $9.99 (dine-in)! 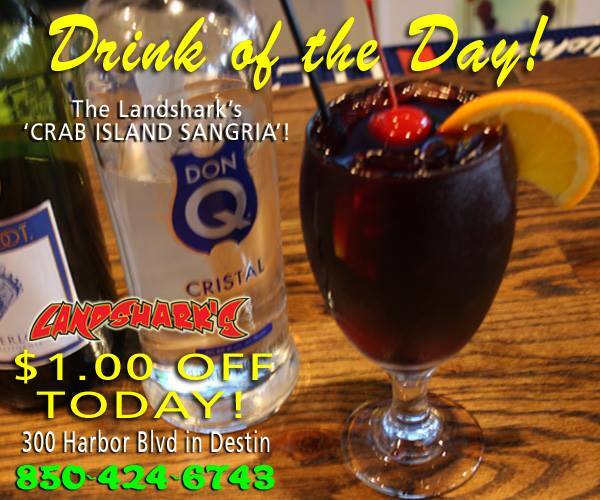 LANDSHARK’S DRINK OF THE DAY – $1.00 OFF our ‘CRAB ISLAND SANGRIA’’ Cocktail – it’s like being in the tropics, only in Destin where it’s hotter and you’re more grateful for a cold cocktail! SPORTS ON OUR ARMY OF BIG SCREENS – 2018 Stanley Cup FINALS featuring WASHINGTON CAPITALS vs LAS VEGAS GOLDEN KNIGHTS Game Five! PGA Tour FEDEX ST. JUDE CLASSIC 1st Round Action! Major League Baseball MIAMI MARLINS vs ST. LOUIS CARDINALS, RAYS vs MARINERS, ROCKIES vs REDS, ASTROS vs TEXANS, Dodgers vs Pirates, White Sox vs Twins, Phillies vs Cubs, Tigers vs Red Sox & more! 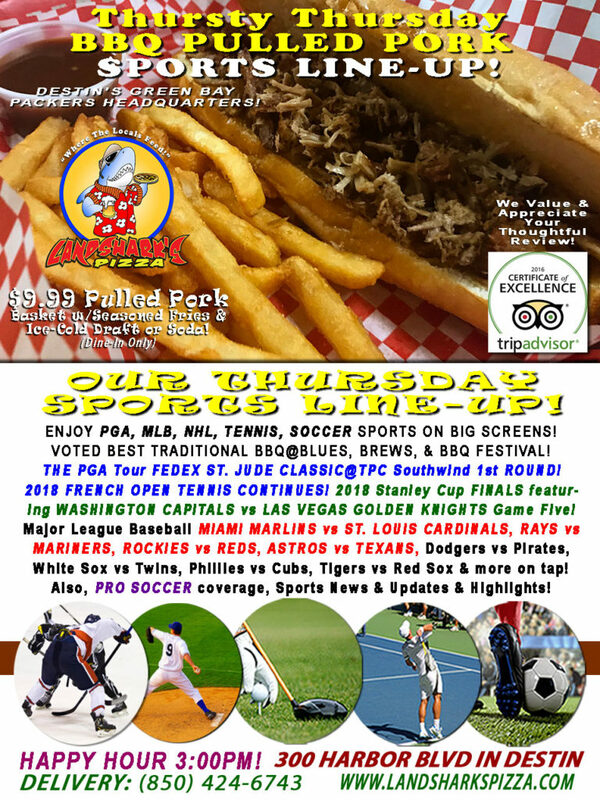 Also PRO SOCCER and PRO TENNIS from THE 2018 FRENCH OPEN coverage plus plenty of other Sports Broadcasts, Sporting News, Analysis, and Commentary! 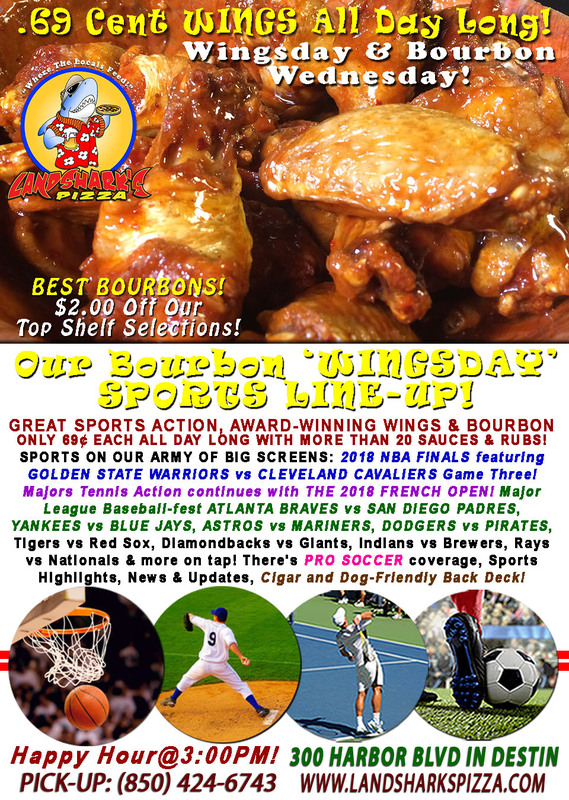 Previous Post: « WINGSDAY NBA Finals WARRIORS vs CAVALIERS, FRENCH OPEN & Landshark’s Wings only 69¢ Ea & $2 OFF ALL BOURBONS!